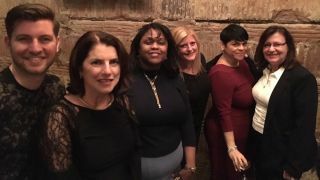 On Wednesday night, the AVIXA Women’s Council NYC Chapter gathered at American Whiskey to mix and mingle with attendees from New York Digital Signage Week. The well-attended event was one of the chapter’s largest to date, according to Gina Sansivero, co-chair of AVIXA Women’s Council in NYC. Over cocktails and conversation, women and men forged new relationships, enhanced old ones, and discussed industry hot topics such as projection mapping and the user experience. For those interested in starting local chapters, Baumanm recommends Betsy Jaffe at AVIXA (bjaffe@avixa.org) as a point of contact. Both Bauman and Sansivero are happy to share their experiences and assist new chapters with their formation. The event was sponsored by AVIXA, Crestron, FSR, McCann Systems, Ministry of New Media, Peerless-AV, and Sapphire Marketing. Megan A. Dutta is the editor of Systems Contractor News. Engage with up-to-the-minute news, live from NYDSW, via https://twitter.com/SCNmag.